We’re delighted to announce that in the past three or four weeks we have reached the point that we have sold sufficient copies of ‘Second Edition: Speed with Safety’ to just about cover our printing costs. As a result of this we have been able to make our first royalty author / editor / publisher payments in the form of contributions to relevant institutions. Polunnio publications are produced to both document the history of Westinghouse Brake & Signal and the North Wiltshire area, and also to raise a little money towards protecting that heritage and supporting local projects. 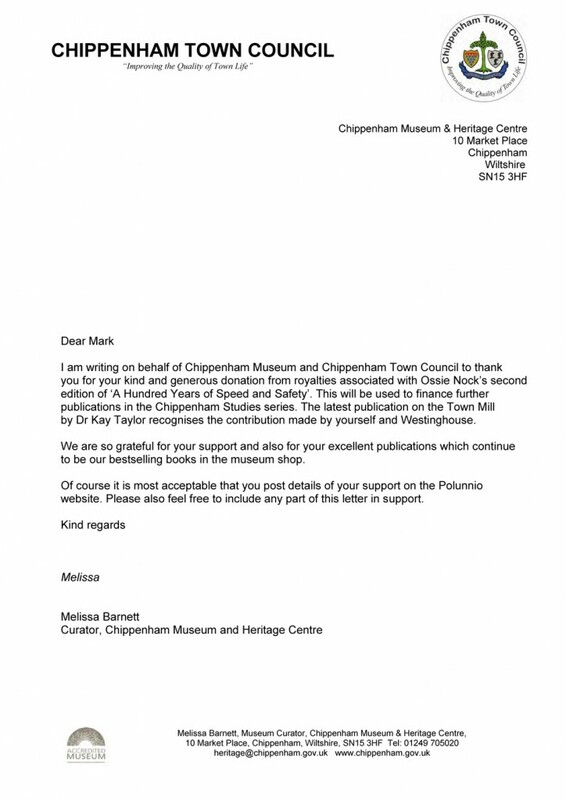 This month we were able to make a contribution to Chippenham Museum & Heritage Centre, one of the major homes of that heritage, and were delighted to receive the attached letter from Melissa Barnett, Curator. Melissa confirms that the contributions will go towards further publications in the ‘Chippenham Papers’ series, the most recent of which is on the subject of the Town Mill, and is written by Dr Kay Taylor. There was an article in our local paper about the publication which is available from the Museum. We also heartily recommend the Museum’s excellent Facebook page as a great source of Chippenham heritage related information. A nice example is the ‘Chippenham in 100 Objects Series’ post of a Westinghouse Bombsight. Westinghouse was hugely productive during the Second World War, producing huge amounts of material for all three armed forces. Plenty about all of that in both of our books. We hope very much to be able to announce other contributions to other relevant causes in the coming weeks and months.